The Neighborhood Convention is an Island-wide multi-faith group formed over 100 years ago. Always meeting on the first Tuesday of the month, at 11:00 am, the Island’s Churches and Synagogue take turns hosting the meetings. After a short worship service, there is a program of interest to all. It is the custom of the Neighborhood Convention for participants to bring a sandwich/salad for their lunch and the host community provides beverages and desserts. All are welcome. The Sewcial Action Knitwork was formed to channel some of the congregation’s considerable needlework talents into projects that provide comfort to people who are going through difficult times in their lives. Items have been created via knitting, crocheting, patchworking/quilting, and other types of needlework. Anybody who is a needle worker, or a novice who wants to learn, is welcome to participate. Knitwork get-togethers are in the afternoons on the first Friday of each month throughout the year. The times and venues for meetings are listed in the Vineyard UU Voice (newsletter), the Sunday bulletin and ‘This Week at UUSMV,” our Friday congregational email. Knitworkers who cannot meet with the group create items independently for collection when they return to meetings. 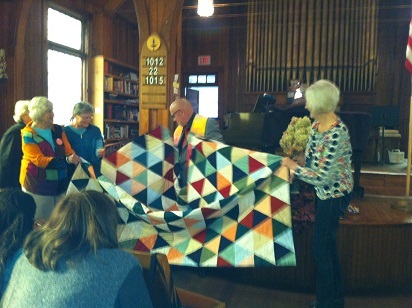 Knitworkers have donated shawls, lap robes, pillows, tote bags and comfort quilts to members of the congregation who are going through challenging times. They have donated to CONNECT to End Violence, (a program of Martha’s Vineyard Community Services) and to Hospice of Martha’s Vineyard. Items have also been sent to soldiers being deployed to Iraq and Afghanistan.